Cambodia is affected by landmines, unexploded ordnance, and other explosive remnants of war left by 30 years of conflict that ended in the 1990s. Although estimates of the extent of mine contamination fluctuate, a 2013 survey estimated total mine and explosive remnants of war (ERW) to be 1,915km2. The Cambodian Mine Action and Victim Assistance Authority (CMAA) estimated total anti-personnel and anti-vehicle mine contamination to be 941km2 at the end of 2017. ERW contamination to include cluster munitions is extensive. Although two official Cambodian estimates put the total cluster munition contamination to be in the 620km2 to 645km2 range, the true total is not yet known with precision. Estimates have been rising as a result of survey activity. Other UXO and ERW make up the difference to reach the 1,915km2 estimate. The antipersonnel mine problem is concentrated in the west and northwest along the border with Thailand and includes the infamous K5 mine belt. Unexploded cluster munitions are concentrated in the Eastern provinces of the country aligned with the Ho Chi Minh Trail. Overall casualty rates have significantly decreased in recent years due to intense clearance operations and to the deterioration of some mine types. The summary table on the Landmine Monitor website shows 137km2 released in 2017 as a result of clearance (91.5km2), reduction (14.52km2), cancellation (26.11km2) and survey (2.7km2). The Humanitarian Demining Research and Development Program has 34 mechanical clearance and neutralization systems under evaluation by the Mines Advisory Group, Norwegian People’s Aid and The HALO Trust. 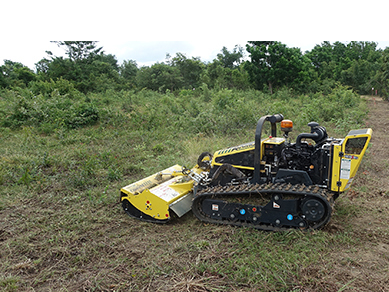 To date, these technologies have assisted Cambodia’s clearance effort by clearing or supporting the clearance of over 41,500 mines and unexploded ordnance items from more than 27,784,000 square meters of land. The Severe Terrain Off-Road Menzi Muck, or STORM, is a commercial excavator designed to remove vegetation in rough and steep terrain. Its four spider-like legs allow the excavator to work on slopes of up to 70 degrees and maneuver around obstacles with ease. Dual hydraulic pumps enable it to use a wide variety of commercial attachments, including a unique cutting head that can cut trees up to 20 centimeters in diameter. Additionally, the system`s hydraulic lines are designed to shut off flow to the ruptured circuit in the event of a mine blast. Distribution Statement A: Approved for public release. Badger, an intermediate area preparation system, is a medium-class 13-ton excavator that can cut vegetation, dig and process contaminated soil, and prepare suspect area for demining operations using a suite of commercial excavator tools. The tools currently available include: soil sifter, brush cutters, grinding drums, grapples and digging buckets. Badger’s reach-in capability allows the machine to travel in cleared areas and operate tools inside suspect area, while its armored cab protects the operator. Distribution Statement A: Approved for public release. Remote controlled excavators are sometimes required when it is too dangerous for manual operation. The Rex is a versatile, light weight (8 ton class) armored excavator designed to clear vegetation, obstacles, and mechanically remove and neutralize anti-personnel (AP) landmines and unexploded ordnance (UXO). 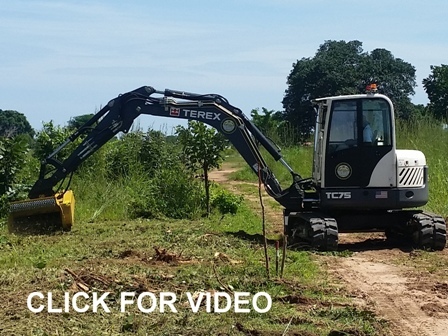 The HD R&D Program developed and integrated two important modifications to the commercial Terex TC75 excavator to create the Rex. These are the addition of remote control capability, and armor protection for the operator when the system is manually operated. Small platform based system advantages are lightweight, versatile and fuel efficient. Distribution Statement A: Approved for public release. 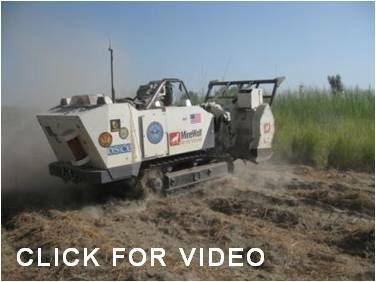 The Humanitarian Demining Research and Development (HD R&D) Program has developed a wide variety of excavator and loader based tools for mechanical mine clearance. These attachments give deminers the capability to perform area preparation, technical survey and mine clearance from a safe area. Tools that have proven useful include vegetation cutters, grapples, tillers, and buckets for sifting, grinding, and crushing. The HD R&D Program has modified several small, medium and large class excavators with armor protection and the interfaces needed to use these tools in various demining environments. Operational Field Evaluations (OFE) can be performed with HD R&D Program developed excavators or loaders, or with just the tools mounted to the demining organization`s own host equipment. Distribution Statement A: Approved for public release. Long handled power tools increase the manual deminers speed, efficiency, and safety. To date, operational field evaluations have taken place in Cambodia, Ecuador and Angola. Distribution Statement A: Approved for public release. Scorpion is a man-portable unexploded ordnance (UXO) detection system that utilizes a one meter wide electro-magnetic induction (EMI) sensor and a total field magnetometer to detect buried UXO objects in an overpass mode. The system uses differential global positioning system (DGPS) to provide centimeter accuracy of target locations and mapping capability. Distribution Statement A: Approved for public release. The Handheld Standoff Mine Detection System (HSTAMIDS) is the U.S. Army`s AN/PSS-14 dual sensor, handheld mine detector that combines an electromagnetic induction sensor and ground penetrating radar (GPR) to detect landmines. The addition of the GPR significantly reduces the detector`s false alarm rate and the time the operator spends investigating clutter, increasing the operator`s speed and effectiveness. The HD R&D program also developed the HSTAMIDS F3S variant which incorporates a more sensitive metal detector to improve performance against deeply buried low metal anti-personnel and anti-tank mines. Distribution Statement A: Approved for public release. Minehound is a commercially available dual sensor handheld detector that uses ground penetrating radar (GPR) and metal detection technology to locate landmines, unexploded ordnance (UXO) and improvised explosive devices (IED). The GPR can be operated independently which gives Minehound the ability to detect deeper buried, low metallic threats. The GPR audio tone provides information on the size and depth of the object it detects. Twenty frequencies are available to the metal detection sub-system, which allows the Minehound to be operated in close proximity to other detectors and near power lines without causing or being subject to interference. The metal detector also compensates for water and mineralized soil without reducing sensitivity. Distribution Statement A: Approved for public release. 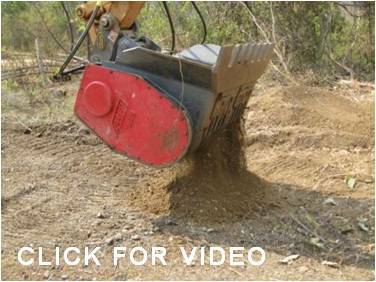 The Piranha is a medium size, remote controlled mine and vegetation clearance system based on a commercially available high horsepower skid steer loader. Piranha is fitted with a high performance vegetation cutter that can quickly cut vegetation up to 20 cm in diameter, and an in-house designed and fabricated tiller capable of clearing anti-personnel landmines to a depth of 20cm. The system is designed to be a small maneuverable platform capable of rapidly conducting technical survey tasks. Distribution Statement A: Approved for public release. The Target Reacquisition Positioning System (TRPS) is a dual-purpose, target reacquisition and survey tool. TRPS is a lightweight, low-cost and highly accurate system that simplifies the use of Differential Global Positioning System (DGPS) for reacquiring ground target positions previously identified UXO detection systems. TRPS is also a surveying tool that provides the ability to quickly survey boundaries, locations of items found, or mark other points of interest with centimeter level accuracy. The Minefield Management Tool provides real-time data logging capabilities for demining managers. Modules provide mapping, survey, equipment, target/data, incident and personnel management capabilities. Distribution Statement A: Approved for public release. 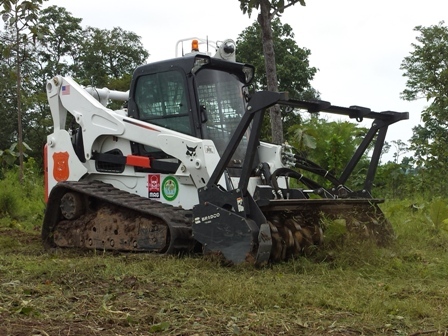 The Bearcat is a remote controlled, skid-steer chassis integrated with a vegetation cutter and a remote monitoring system for operation in suspect mine and UXO contaminated areas. Bearcat utilizes a completely commercial-off-the-shelf (COTS), plug-and-play, remote control system, and is designed for a wide range of area preparation tasks. The system allows demining and battle area clearance teams to quickly and efficiently remove vegetation for follow-on manual clearance teams. Distribution Statement A: Approved for public release.